TAMPA, Fla. (March 1, 2018) – Women For Tri®, a program of The IRONMAN Foundation®, today announced its 2018 Women For Tri Ambassador Team. The team comprises 27 Regional Ambassadors and three Brand Ambassadors who span seven countries across the globe. These female athletes will represent Women For Tri to introduce more women to the sport of triathlon at a grassroots level, helping to overcome barriers to entry through the leadership of first-timer initiatives, engaging their community of women in local races, leveraging their position as triathlon influencers through social media campaigns and the continued building of the Women For Tri global social community of more than 40,000 women. Women For Tri welcomes three Brand Ambassadors to the 2018 team: Minda Dentler, the first-ever female hand-cyclist to finish the IRONMAN® World Championship in Kailua-Kona, Hawai`i in 2013; Julie Moss, a trailblazer for women in long course triathlon who brought significant exposure to the sport with her 1982 finish at the IRONMAN World Championship; and Samantha Warriner, a standout triathlete and competitor for New Zealand in triathlon at the 2004 Olympic Games. 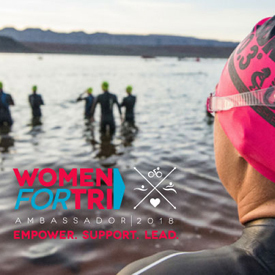 To learn more about the 2018 Women For Tri Ambassador program, please visit www.womenfortri.com/our-community/women-for-tri-ambassadors. To find information about events in your surrounding area and join the Women For Tri Ambassador Support Crew, please contact womenfortri@ironman.com. For media related inquiries, please contact press@ironman.com.